What are Sacred Days? They are days that will only occur once every thousand years. How amazing is it that we are among the few who live in a millennia where we will experience a period of sacred days in 12 years that will NOT be experienced by humans again until the millennia of 3001. Each of these sacred days we have participated in special bindings, ceremonies and rituals. It is a day PACKED for us. The strongest time to cast is during the sacred hour of these days from 11pm-12am. This is for a gemstone charged with the energy of 06-06-06 which is great for working with other spells and entities for curse reversals. 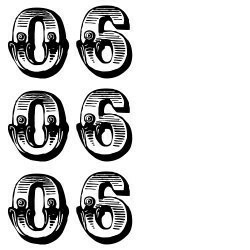 The amazing power associated with the day 06-06-06 is unmatched by natural energy for cleansing & reversing curses, hexes and evil energies/entities. Reversing a curse means in this case reversing the effects of the curse, i.e. if it was meant to bring you bad luck you will have a turn of good luck! This is not meant to be used in sending a curse back to someone. Trays of gemstones and vessels were placed outside from 12am to 4am to absorb the awakening hours of the day's energies. Those of you who own stones from 07/07/07 are familiar with what the energy will be like. You will have a chance with us every year to do this and it is my goal and Ash's goal to obtain a vessel for each of the 12 years and we know that by owning pieces from each of the sacred years the energy and power will be AMAZING, INCREDIBLE & SHOCKING! We are going to post all that we can for the prior sacred years. I know for some of them we have very limited quantities of what we casted for that particular year.